Position a rack in the upper third of the oven; preheat to 450 degrees F. Put the chicken on a foil-lined rimmed baking sheet; drizzle with 1 teaspoon sesame oil, sprinkle with the five-spice powder and toss. Arrange skin-side up; season with salt and pepper. Roast until the chicken is cooked through and the skin is crisp, 25 minutes. Meanwhile, stir the hoisin sauce, brown sugar and remaining 1 teaspoon sesame oil in a small bowl. Grate 1 garlic clove into the sauce; set aside. Chop the remaining garlic. Trim the broccolini and slice lengthwise into long florets. Trim and scrub the carrots; halve or quarter lengthwise. Preheat the broiler. 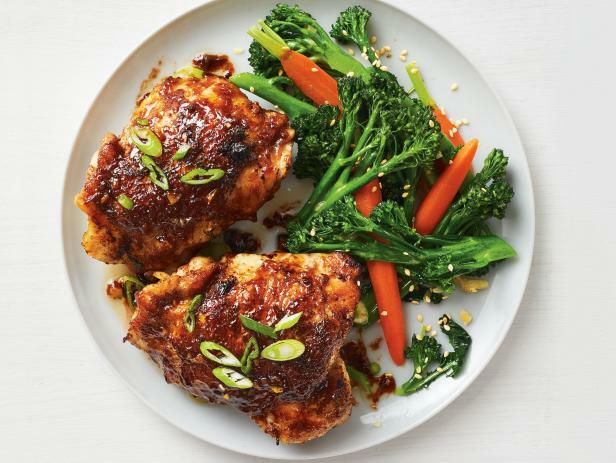 Brush half the hoisin sauce mixture on the chicken and broil until bubbling, 1 to 2 minutes. Brush with the remaining sauce and broil 1 to 2 more minutes. Heat the vegetable oil in a large nonstick skillet over medium-high heat. Add the broccolini, carrots and chopped garlic; season with salt and pepper. Cook, stirring, until the garlic is soft, 1 minute. Add 1/4 cup water, cover and cook until the vegetables are crisp-tender, about 4 minutes. Uncover and stir in the sesame seeds. Divide the chicken among plates; top with the scallion. Serve with the vegetables.